Tapple - get it here! ﻿﻿﻿﻿﻿﻿﻿﻿﻿﻿﻿﻿﻿﻿﻿﻿Note: This post contains affiliate links. An SLP can never have too many language games. One relatively new game on the market is "Tapple" by USAopoly. And you know it has to be a great game when it has your students rolling on the floor laughing (literally)! I was drawn in right away by the intriguing design of the game board - a wheel with little letter tabs sticking off to the side. To play, players sit around the Tapple board. A card with a general category (e.g., movies) is chosen and players have to think of a matching item for the category. The trick is to think of something within 10 seconds before the timer is runs out! When a player comes up with a match, they hit the beginning letter (e.g., G - Guardians of the Galaxy), press the timer to reset it to 10 seconds, and pass the wheel to the next person. The task gets more difficult as the game progresses because there are fewer letters left to choose from. The game is recommended for ages 8 and up and can be played with 2-8 players. My 3rd graders thoroughly enjoyed this game and even though they struggled at first, improved with their skill throughout the session. Granted, I did choose some of the easier categories (vegetables, things at a grocery store, cartoons, ...), but I wanted this to be an achievable task for them. This is a great game to use when working on word-finding, categorization, or even articulation. You can adjust the difficulty level by opting out of using the timer or telling students that they can re-use a letter that has already been pressed down. 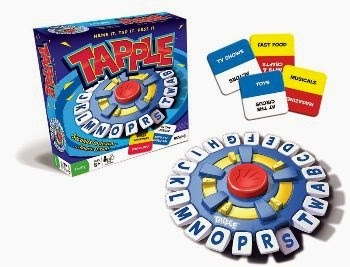 Of course you don't have to play by the rules and could adapt the Tapple board for other speech activities, such as having students think of a word that has their articulation sounds in it, etc. The game requires minimal set-up, but provides a maximal fun learning experience, which makes it a great choice for any Speech room! Please note - you will need two AA batteries.